44: What's the problem with too much clear? 37: Say Good-bye to Your Practice! In episode 37 I talk about our culture's tendency to always be practicing. When we are practicing we are thinking, and in thinking, we are not in pure presence and experience. So this episode encourages you to throw your practice out the window, move beyond thought, and to live your life. www.shannonelliottyoga.com Om Shanti. 35: Svatantrya, the Power of Freedom! 27: Be Here Now- Atha! In Episode 21: "From the Couch Friday!" I discuss healing using the yoga practice, the 8 limbs of yoga, and our relationships. Yoga has been the consistent piece through my life transitions, one I am grateful for and here to say works. Make sure you listen all the way to the end of this one, I leave you with a beautiful pearl of wisdom from Reverand Jaganath Carrera. Much love. 18: Stop wasting time not being you! What is the point of the physical movement class? Is there something post-savasana we can be doing before we get up and off the mat? Yoga is FOR you. The yoga process is a journey to YOU. This is a meditation (however there is talking so you can listen in your car instead of doing the meditation- there are about 3 minutes of silence at a certain point.) And then enjoy it at home and try it out! Thank you for listening. In Episode 16, Ahima (non-violence) is broken down. How can you explore this in your daily life? How can we turn this into a positive that elevates our capacity for love? And what does love have to do with it? From the Yoga Sutras of Patanjali, one of the Yamas right here on the Embodied Living Yoga podcast. Thank you for listening. 13: Just Do the Thing! In Episode 13: How do we move through the blocks when we feel like we can't? What's the secret to reconnecting? How do we take the action of our own dharma (life purpose)? In this episode I break it down, give simple suggestions and tools to live your life with a smile, build friendships, and move into fulfilling both your inner and outer world. Just do the thing! 12: Rigidity, is it worth it? 10: Brain Fog is Real. Drain Your Brain! 09: Non attachment, what does that even mean? In Episode 9 nonattachment is contemplated. What does nonattachment even mean? How do we know what we want is even what we need? What do wants really bring out in us? Can we be okay just being? Does nonattachment mean we do not care? Listen here to explore how nonattachment can actually bring you more peace, purpose, and internal joy in your life. Thank you for listening. 08: How does Yoga help when you are 10 steps behind? In this episode we begin with the Sanskrit word Purnatva, the state of being whole and fulfilled (you have everything you need and everything you need you have.) I was reminded of this teaching when my day started out 10 steps behind before my eyes even opened. I reveal how I used the teachings of Yoga to stop the downward spiral and come back to center. This episode is a great example of how to use the Yoga practice in a real way, when anxiety and overwhelm strike. Please listen, practice and share. Much love. 07: Inner Exploration, oh My! In this Episode I discuss what happens when we begin to do the deeper work of staying in awareness and allowing ourselves to be with the revelations that come. Yoga gives us an opportunity to know ourselves better, to accept, to cleanse, and to elevate. And this can only come through radical honesty. May we all be willing to share our truths in each moment, may we connect deeper, and may we help to elevate one another. Thank you for being a part of this community. In Episode 6 I share a breathing practice that will reveal a deeper inner experience and elevate how you think, feel, and act in the world. I am finding profound shifts in my subtle body through this breath focus, I would love to hear about your experience of playing with this technique. Honored you are here, thank you for listening. In Episode 05 it is time for reflection. One of my teachers, Reverand Jaganath Carrera (http://www.yogalifesociety.com/) states one of the ways to reflect on our own spiritual evolution, is to ask ourselves the question: "Am I more loving today than I was yesterday?" What a beautiful practice and a way to hold ourselves to center and stay honest on our path. Lokah Samastah Sukhino Bhavantu. Many, many thanks for being here. 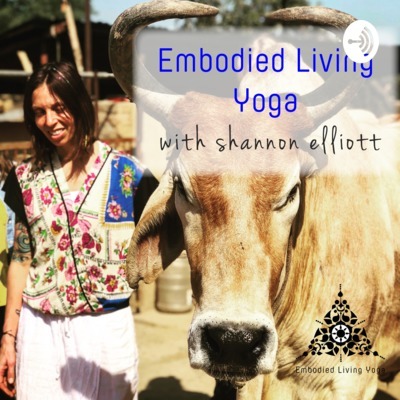 In Episode 4 of "The Embodied Living Yoga Podcast" we explore how being rigid in our beliefs can keep us in a "truth" which ends up not being beneficial to us or our relationships. Satya is one of the Yamas, which is the first of the 8 limbs of Yoga, from "Patanajali's Yoga Sutras." What I love about this is the infinite ability for us to explore and expand or viewpoints when it comes to truth- creating deeper connection to ourselves and holds more tolerance and space for others. Thank you for listening! The very first episode of Embodied Living Yoga! Did you know the way to a deeper breath is to exhale first??? What I value most is creating a nourishing practice for both myself and passing it on to others. This is a simple but deep concept and I hope you take the time to play with the profound internal shift this can create in your own being.